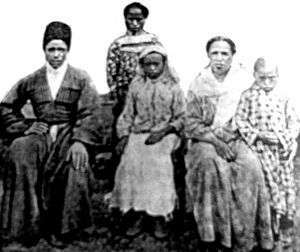 Photo of Afro-Abkhazian family from Caucasus. formerly Adzyubzha, currently Russia and other parts of Abkhazia. Afro-Abkhazians, or Abkhazians of African descent, were a small group of people of Black African descent in Abkhazia who used to live mainly in the settlement Adzyubzha at the mouth of the Kodori River and the surrounding villages of (Chlou, Pokvesh, Agdarra, Merkulov, etc.) on the eastern coast of the Black Sea. Like the Afro Turks, they trace their origin back to the African branch of the Ottoman slave trade. 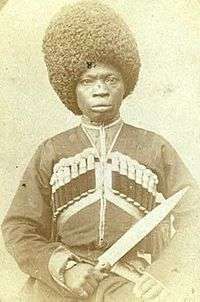 An Afro-Abkhazian. Photo by George Kennan, 1870. The ethnic origin of the Abkhazians of African descent—and how Africans arrived in Abkhazia—is still a matter of dispute among experts. Historians agree that the settlement of Africans in a number of villages in the village of Adzyubzha in Abkhazia (then part of the Ottoman Empire) is likely to have happened in the 17th century. According to one version, a few hundred slaves were bought and brought by Shervashidze princes (Chachba) to work on the citrus plantations. This case was a unique, and apparently not entirely successful, case of mass import of Africans to the Black Sea coast. In 1927, the Russian writer Maxim Gorky, together with the Abkhaz writer Samson Chanba, visited the village of Adzyubzha and met elderly Africans there. Based on his visit and a comparison of his observations with the published data, he felt that the Ethiopian version of the origin of the Abkhazians of African descent is true. There are a number of folk legends that might be based partly on true events. According to one of them, which is mentioned in the memorandum of Ivan Isakov to Nikita Khrushchev, an Ottoman ship wrecked near the Abkhazian coast during a storm, with slaves who were brought up for sale, and the current Abkhazians of African descent are the descendants of survivors from the ship, who founded the colony in Abkhazia. This legend, however, does not explain how such a ship could have entered the waters of the Black Sea, which is so far from major shipping lanes of the slave trade of that time. Another legend tells about the dealings of Narts with certain "black faced people" from the Horn of Africa. The legendary Narts are said to have come back to the Caucasus from a long African campaign with hundreds of African escorts, who remained in Abkhazia. Herodotus, writing about his visit to Colchis in the 5th century BC, described the people there as "dark-skinned and wooly-haired",yet this refers to the caucasian tribes that lived in the region at the time of his visit, as they predate the Afro-Abkhazians who arrived via Ottoman slave trade some time during the 17th Century. He speculated that the black Colchians were soldiers from the army of the Egyptian conqueror Sesostiris that he left in the area on his return from what is now South Russia. 2200 years later, journalist John Gunther wrote about a small community of Africans in Abkhazia. The said memorandum of Ivan Isakov to Khrushchev on the Abkhazians of African descent says, among other things, that the governor of the Caucasus Hilarion Vorontsov-Dashkov, imitating Peter the Great, had his personal convoy of Afro-Adzyubzhi, who accompanied him in Chokha. Prince Alexander of Oldenburg, founder of Gagra, kept in his yard a few representatives from each of the peoples of the Black Sea coast of the Caucasus, including the local blacks. It is known that already in the 19th century, Afro-Abkhazians spoke only in Abkhazian and identified with Abkhazia. Their total number is estimated by different observers in the range of "several families" to "several villages". They are not religiously homogeneous, either. Apparently in Abkhazia there are or have been in the recent past black Christians, black Muslims, and black Jews. Afro-Abkhazians engaged in growing citrus, grapes, and corn, working in the coal mines of Tkvarchreli and enterprises of Sukhumi, working in knitting factories, etc. Like Abkhaz people, the Abkhazians of African descent today also speak in Russian. Many left Kodor to settle in other parts of Georgia and in neighbouring Russia, as well as other nearby countries. The presence of Afro-Abkhazians is also found along with Abkhaz communities in Turkey. Afro-Abkhazians and their relationships with indigenous Abkhaz were featured in prose by Fazil Iskander. ↑ Абхазские негры (Russian) Archived December 31, 2009, at the Wayback Machine. 1 2 Негры в Кодорском ущелье(Russian) Archived March 13, 2009, at the Wayback Machine. ↑ Загадка национальных корней Пушкина(Russian) Archived May 24, 2011, at the Wayback Machine. ↑ Нарты у чернолицых людей(Russian) Archived March 13, 2009, at the Wayback Machine. ↑ Зана, самка снежного человека-2(Russian) Archived March 13, 2009, at the Wayback Machine. 1 2 English, Patrick T. (1959). "Cushites, Colchians, and Khazars". Journal of Near Eastern Studies. 18 (1): 49–53. JSTOR 543940. ↑ Abhazya’da Yaşayan Siyahiler – AБХЪАЗ ШIУЦIЭХЭР(Turkish) Archived July 27, 2011, at the Wayback Machine. ↑ Rayfield, Donald (1998). "Sandro of Chegem". In Cornwell, Neil. Reference Guide to Russian Literature. Chicago, IL: Fitzroy Dearborn Publishers. pp. 398–399. ISBN 978-1884964107.